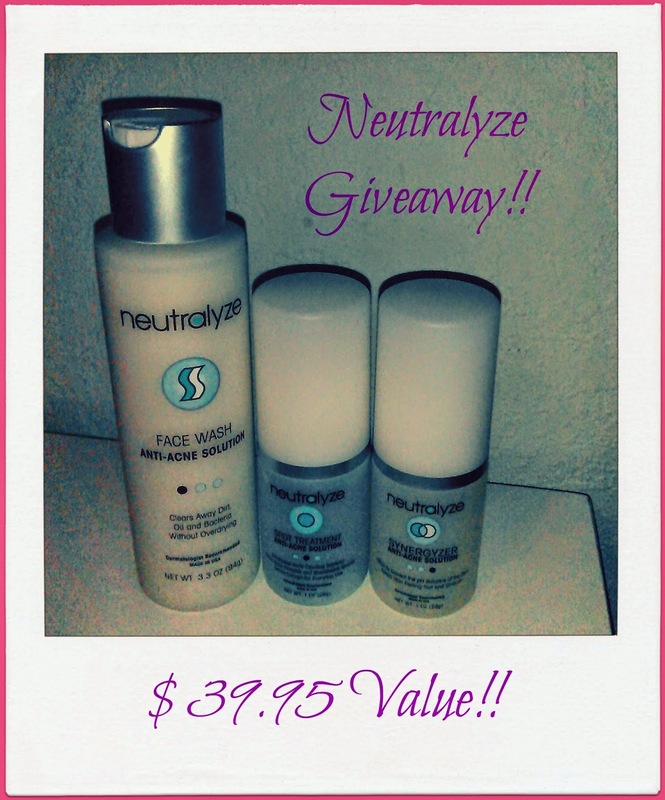 The Girl With The Spider Tattoo: Neutralyze Acne Kit Giveaway and More! 8/11/14-8/25/14! Neutralyze Acne Kit Giveaway and More! 8/11/14-8/25/14! I had a really bad problem with acne when I was younger. It didn't seem to matter what I used...It just seemed to get worse and worse whenever I'd try out a new product that was said to help it disappear. In fact, one product that I used was so bad that it left acne scars that are only now starting to fade away and I'm about to be 30. Anyhow, I was given the opportunity to try out a completely different product called Neutralyze a few months ago. Ever heard of it? It's a pretty good product! Cleared up my skin quite a bit and did not dry it out! It comes in a set of THREE bottles- Face Wash, Spot Treatment and Synergyzer. I read on the website that it's used to treat moderate to severe acne by penetrating acne causing bacteria, quickly, getting rid of pimples, blackheads, whiteheads and even cysts! It's a non-irritating formula and allows your skin to heal naturally. Product contains salicylic acid, mandelic acid and nitrous acid, which when combined, help you get clearer skin. Face Wash/Cleanser (step one)- Gentle, even on sensitive skin. Eliminates bacteria, dirt, and oil in about 60 secs. Spot Treatment (step two)- Treats breakouts and promotes healing by removing dead skin cells from the surface. Unclogs pores and allows sebum to escape freely. Synergyzer (step three)- Enhances the antimicrobial efficacy through residual bacteria fighting action. The acne clearing process then continues for several hours after you apply it. Also corrects the pH balance of the skin, which helps to promote healing and restores your natural glow. Since I am part of this incredible Summer Giveaway Hop (this is my first one!) and I love to give away products to my amazing readers, I am going to be giving away a FREE set of these three products to ONE lucky person!!! Yay! Winner will receive a set of three bottles -cleanser, spot treatment and synergyzer. Winner must be 18 or older and reside in the U.S. Winner will be chosen by random.org so that everyone has a fair shot at winning. Winner will be contacted via email. Also, since this is part of a huge giveaway hop---please do feel free to enter all of the other great giveaways below!!! There are so many amazing prizes!!!! Enter as many as you want! 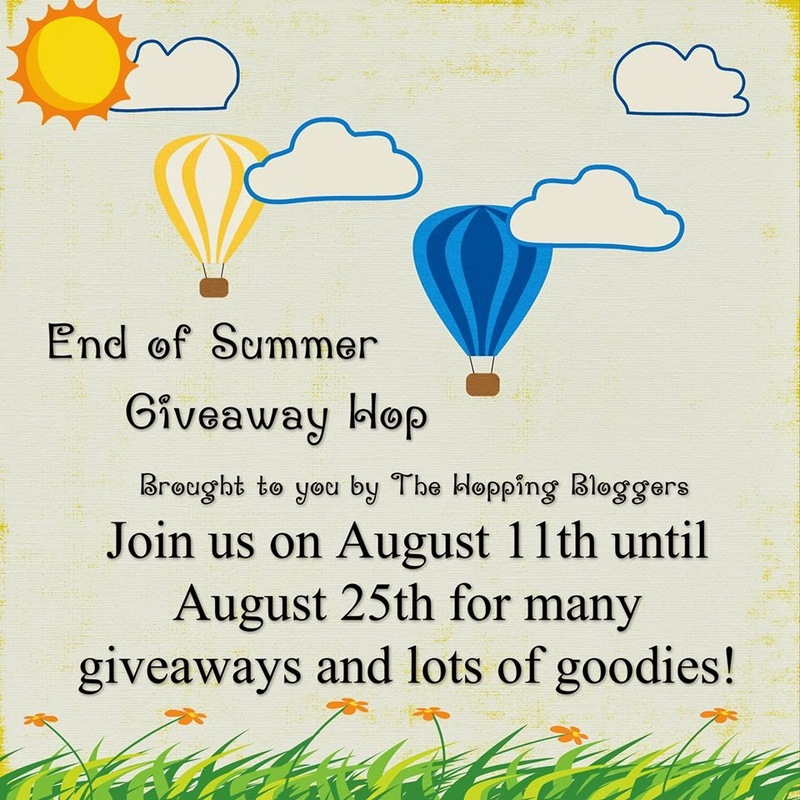 Welcome to the first annual End of Summer Giveaway Hop, brought to you by The Hopping Bloggers! We are a group of bloggers that specialize in giveaway hops - so stay with us and you will have many chances to win some amazing prizes! Each blogger participating in this hop has a giveaway with a prize value of at least $15 - and some are much more than that! Be sure to visit them all - there is no limit to how many prizes you can win! Good Luck and Have Fun!